Two recent posts from (parts I and II) review a graduate student forum where two university staff members presented their thoughts about career paths. I’d like to use these as an opportunity (well, excuse) to pull together in one post some of things I have previously written on this topic, about science-based careers outside academia. It’s good to see career paths being discussed with Ph.D. students and the points offered are excellent. I wouldn’t have minded a similar presentation when I was younger. It is also clear from Sarah Morgan’s account that discussion of careers outside academia took place. Great to hear. I hope this encourages institutions to offer presentations from people outside of the universities. A point I would like to elaborate below is that these people are not exceptions, but are the rule. It is the academic research career that is the exception. These presentations are usually meant to be guidance for an academic career – fair enough – but I would prefer they be set within a wider context. I worry that a narrow focus on only an academic career will disappoint many, when a decent fraction, if not the majority, of Ph.D. students should be looking more widely. A general perception (assumption or, perhaps, well-meant intention) is that while most science undergraduates will not go on to academic science, many Master’s students will and most Ph.D. students will. 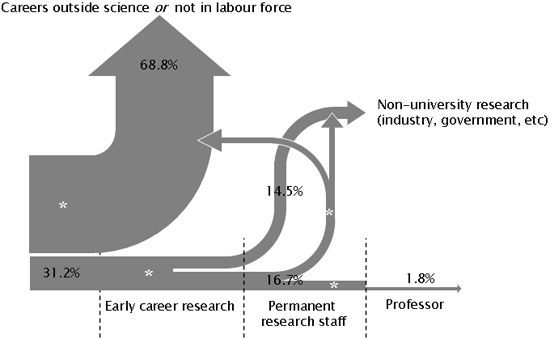 As the graphic above does not show ’all movements within the workforce, such as career breaks or people returning to research after pursuing another career’ a little care is needed not to over-interpret it. A career break (e.g. OE) may account for some of those that do not immediately go into a science-related career. These confounding factors shouldn’t affect the message that most do not go on to academic research careers. Part of the issue, I suspect, is that most academics, Ph.D. students included, are by their nature are stubborn and dislike ‘letting go’! Staff might help here by encouraging their students not to ‘cling’ to an academic option, but to explore broadly. Most find this for themselves, but some may need encouragement. As I mentioned, a related aspect is if working in academia is a ‘fit’ to the person. (The same applies in reverse for other career options.) This isn’t the case for everyone with a Ph.D. The ‘fit’ is more about your particular skills, inclinations and objectives than the qualification. I wrote on this to high school students, but this applies to us all at all levels. Some may be happier working in a commercial setting as part of a large team, leaving management to a manager. And vice versa, some might aspire to be a science manager, leaving the day-to-day science to those with better practical skills. It’s perhaps worth mentioning that being a research group leader or a lecturer is very different to being a student or post-doc, and that it may help to spell out what these jobs actually entail. A pattern I have seen from articles and discussions on-line is of those who left academic science is that somewhere along the way they realised would be better suited elsewhere, and that often these people wished they had recognised that sooner. Active encouragement for students to think widely about this might serve them well–? This article is not directed ‘at’ the previous articles: I’m only using them as a launching pad (read: excuse) to round up my previous writing on this topic. In any event, their students are clearly already thinking about alternatives to academia. ** Includes natural and physical sciences; information technology; engineering and related technologies; architecture and building; agriculture, environmental and related studies; health. Excludes: education; management and commerce; society and culture; creative arts; food, hospitality and personal services; unknown. Good points Grant. Too often people leaving academia are viewed as failing somehow, when they very clearly are not, and perhaps are taking a braver option. As academics we need to find some way to support those career paths better. Thanks Peter, although I wouldnâ€™t have written â€œbraver optionâ€ for what I was thinking of. Itâ€™d be good to see better support for non-academic career paths, but perhaps the more important â€” and easier â€” thing is simply to encourage students to think widely and to explore all options? Keen students with an eye to them will always find a way to take up that marketing paper, that legals course, etc., provided that’s possible at all. As the universities tend to dominate the scientific environment, it’s not surprising that academic positions are considered to be the premiere job. However, basic maths supports the idea that only a minority of PhD’s will ever obtain an academic positions, even if such maths have been conveniently ignored. 1) No matter how carefully you think you have your career planned, opportunities or challenges can arise at any moment. I think teaching students to view their career preparations with flexibility and adaptability in mind is key. 3) A good mentor can help a lot. Sometimes PhD supervisors don’t do this well at all and students may need to seek an informal mentor. Good contacts can help find good postdoc and academic positions. 4) Getting an academic position can be as much about luck as good management. 5) Publish or perish. A PhD or post doc with limited publications will find it difficult getting an academic position and some projects no matter how hard you work don’t result in publications. 6) We need more scientists in education and government supporting science. If scientists enter such fields it shouldn’t be considered a failure, rather they are doing vital work that will potentially ensure more funding and students for university academics in the future. Alison, perhaps you should write something more about your experience in school teaching and the move back into academia, as most people probably assume that once you are “out” of the tertiary system you can’t get back in? As the universities tend to dominate the scientific environment, itâ€™s not surprising that academic positions are considered to be the premiere job. I hope no-one thinks I am accusing anyone of â€˜conveniently ignoringâ€™ these statistics! About point 5, I suspect the type of publications matter to an extent too. Some have more â€˜meritâ€™ than others. For example, I suspect â€œdatabaseâ€ papers in bioinformatics arenâ€™t perceived as having as much merit as â€œexperimentalâ€ papers in the eyes of grant committees. Apply the same skills/methods to an analytical paper, and essentially the same type of work may be considered more meritorious – ? Just looking at many of the professional scientific societies in NZ – Royal Society etc – many seem to be dominated by university academics. It also seems to me (happy to be proven incorrect) that when the govt wants an inquiry on something scientific they immediately look to university academics. Also look at the make up of Marsden fund selection committees. I’m not saying that this is wrong, just that University academics appear to hold sway over many professional organisations and this has the potential to create myopic decision making. Actually “conveniently ignored” was a bad phrase to use in my previous post. When a system is working in ones favour then one is less likely to notice potential problems. So I shouldnt have implied conscious ignoring of statistics. Rather, if the statistics are not affecting someone then why would they bother looking at them?